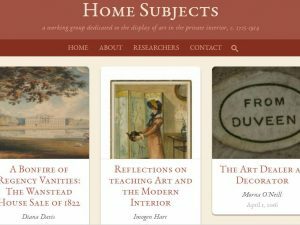 Home Subjects is a website and blog that brings together those interested in exploring an alternate history for the display of art in Great Britain: its important role in decorating the private interior, c. 1715-1914. The decoration of and display of art in the private home have become the focus of a tremendous amount of academic energy during the past five years. Yet much scholarship of the past two decades has posited that British art developed primarily in relationship to the growing number of art institutions and exhibitions that captured the public imagination. This compelling narrative has overlooked the persistence of a cultural ideal premised on private and domestic spaces for exhibiting and experiencing art. 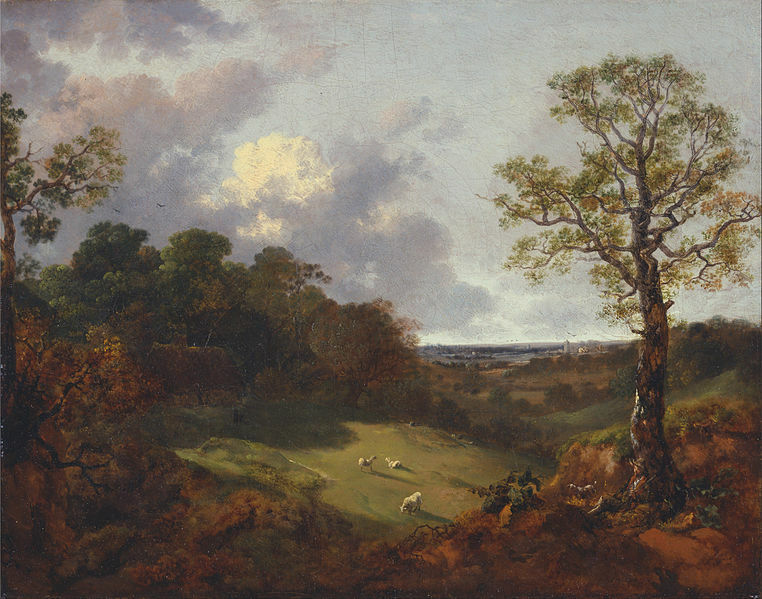 Though the quote from Richard Westmacott that headlines our page focuses on the display of painting, the parameters of this working group are much broader. The goal is to explore the display of art in all media, especially the decorative arts and their interaction with the “fine arts.” Domestic display also hinges on the related subjects of collecting, marketing, and even new developments in architecture, to name only a few of the directions this research could take. Home Subjects grew out of a conversation enabled by the Humanities Institute at Wake Forest University: in April 2012, Dr. Anne Nellis Richter visited Wake Forest and presented her research on the display of art in the home to my eighteenth-century European art class. We talked to students about this new direction in the field, about the challenges of researching and recovering decorative schemes, and about the ways in which social class and institutional histories inflected these endeavors. These concerns fascinated the students, who were familiar with some of these issues from their class visits to Reynolda House Museum of American Art. At that time, Anne and I began to talk about a way to bring together interested students and researchers to create an online scholarly community, and our conversations soon grew to include Melinda McCurdy. As a curator at the Huntington Art Collection in San Marino, California, Melinda added a new perspective to our conversation. Her audience is the general public, rather than the college student, and the art under her care is displayed in a way that addresses both the domestic interior and the museum gallery. We launched Home Subjects in April 2014. We have presented at conferences in New York and London, and we have gathered nearly 2,000 views of the blog. Our posts are cross-posted by professional organizations like the American Society for Eighteenth-Century Art, as well as research centers and museums. In the Fall 2015, the Wake Forest University Humanities Institute sponsored a redesign of the Home Subjects site to allow for the creation of a network of researchers working on related topics. Please visit us at homesubjects.org. This entry was posted in Collections, Digital Humanities and 18th-Century Studies and tagged Art, digital humanities. Bookmark the permalink. Morna O’Neill (University of Notre Dame, B.A. ; Yale, Ph.D.) is Associate Professor of Art History at Wake Forest University, where she teaches courses in eighteenth and nineteenth-century European art and the history of photography. She is the author of Walter Crane: The Arts and Crafts, Painting, and Politics, 1875-1890 (Yale University Press, 2011), which won the Historians of British Art Book Prize for 2012. She is the co-editor, with Michael Hatt (University of Warwick), of The Edwardian Sense: Art, Design, and Performance in Britain, 1901-1910 (Yale University Press, 2010).